Hello friends , today i am talking about one process which can be most useful for us who done lots of programs and processes at a time.Process Lasso is a one priority optimization process. we all know its very important and main feature that called " Pro balance". Pro balance means process balance which effects directly on our PC. pro balance very easily adjusts the priorities of the processes and allow CPU to run programs very smoothly.by pro balance user can take full control of process automatically on their computers. Second thing is that you can perform many operations and applied setting at a time. also you can remove some processes from running. pro balance is more effectively lead responsiveness while high loads on PC. Now let's talk about its latest version which is version 5.10 . it has all the features of previous version and adds features as follows. here i write down few steps for run this process. 1. Download and run process lasso appropriate to your operating system(32 bit or 64 bit). 2. It will automatically start CPU eater control application. 3. Press START button for initiating test in background process running at NORMAL priority. 4. If PC look like freeze then please wait and after sometime it will work normally. we can also increase priority of control application. 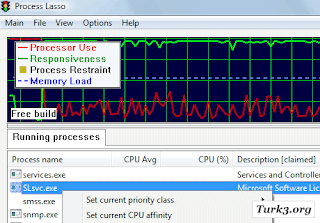 you can press STOP button for terminating process that is hogging CPU cycles.